Will The Next Great Saratoga Cocktail Be Hamlet & Ghost’s ‘Saratoga Sunset’? Local bar's co-owner and mixologist Brendan Dillon serves up a twist on a classic. 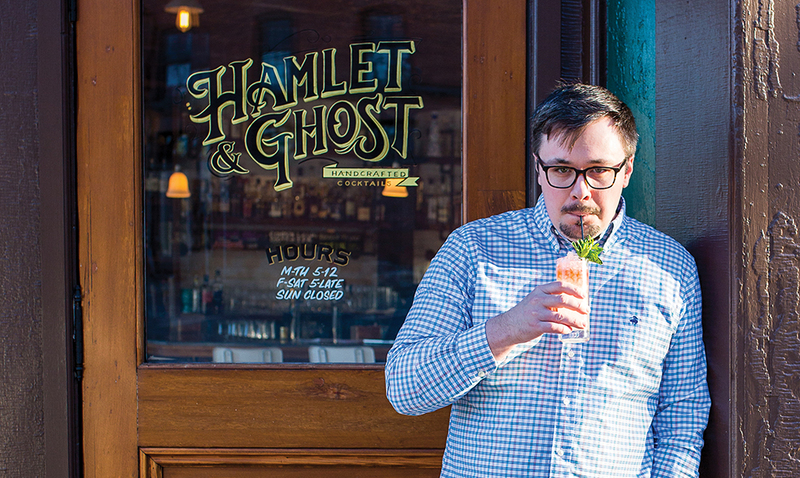 Hamlet & Ghost is first up as saratoga living endeavors to crown the legitimate heir to the next great Saratoga cocktail. We wanted to play on the idea of what a Saratoga Sunrise 2.0 might be. This recipe sticks to what makes the sunset classic, refreshing, easy to drink and fruit forward, while keeping the classic layered look. We exchanged vodka for a citrusy, approachable gin, and the flavors of orange and cranberry for the more tropical and fun passion fruit. Maraschino gives the drink depth and balance, while mint and crushed ice make for a refreshing drink that can be served all day. Peychaud’s bitters are a classic New Orleans cocktail ingredient, and if any town can match the raucous high energy of a summer in Saratoga, it would be the Big Easy. In a shaker tin, lightly muddle six mint leaves. Add gin, lemon, Maraschino, passion fruit liqueur, simple syrup. Add ice, shake. Strain into a tall glass filled with crushed ice. Add six or seven dashes of Peychaud’s bitters. Garnish with fresh mint.